B-Wings (B-ウィング, B-Wings?) is a game released for both the Arcade and the NES. 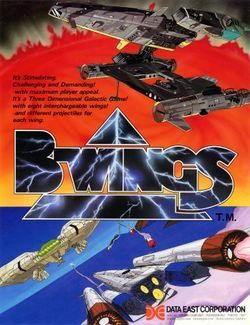 It was developed by Data East and released in the arcades as Battle Wings in certain parts of the world outside of Japan. It was later converted for play on the Famicom in 1986, with three additional wing types. B-Wings consists of 45 stages. The background story is unknown. The player controls the FX-1, which can be upgraded to a more powerful fighter by collecting various wings that attach to the main craft. Each wing has a different form of additional firepower, and the wings can be detached at will by pressing the second button or replaced with a different set. The player must ultimate destroy the GOBUNASU fortress. Normally, you fly at a high altitude, but you can press the second button when you are not wearing wings to descend to the ground briefly, before rising back to the top. While you are close to the ground, you are impervious to any overhead attacks and enemy aircraft. However, you are still vulnerable to attacks from enemies which hover over the ground, or ground based structures that you normally fly over. This page was last edited on 13 June 2013, at 04:03.